Ever have grits? It's dried, ground corn, simmered in milk or another liquid. It's relatively bland, so most recipes jazz it up a tad or serve under something else. 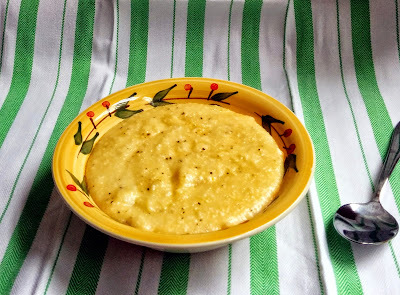 I prefer it simple cheesy porridge-style for a leisurely Sunday breakfast, but to enjoy on weekdays I make it the night before, then slice-and-serve for a speedy breakfast, lunch or brunch. 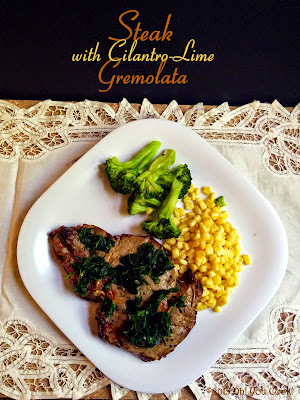 I know, I know ... you saw the name gremolata and figured this must be a fancy-schmancy recipe that uses oodles of exotic ingredients that can only be bought at Whole Paycheck and takes hours to prep. Nopers, Dear Reader. Gremolata has so few ingredients and so few steps that you can throw it together in less time than it takes to grill the steak. Yes, Dear Reader, it's that easy.